Back in May we looked at the increase in drones being used by criminals. Today it is being reported in the media that the Metropolitan Police force is considering using trained eagles to take them down, as is being pioneered in the Netherlands. You can see a video of the eagles in action here. The Dutch are calling it a “low-tech solution for a high tech problem” (which contrasts nicely to a recent story we reported on, the Hatton Garden Heist, where ‘old school’ criminals were caught out by new technology!). 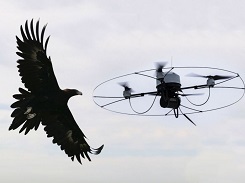 Eagles will naturally attack other birds of prey that encroach on their territory and they are being trained to respond to drones in a similar way. They simply swoop in and grab them with their talons to take it down. Some animal rights groups have expressed misgivings, worried that the birds could be hurt by the drones’ rotors but those involved with training them say that they have advanced visual acuity and are able to avoid them. Met Police Chief, Sir Bernard Hogan-Howe, has reportedly been shown videos of the birds in action and is very interested in using them in London to tackle drone crime. He is thought to be open to new and innovative ideas for tackling crime and sees this as a good example of doing things a little differently. Drones are becoming increasingly inexpensive and this has led to their use becoming more commonplace for crime. They can be deployed to spy on homes for burglaries and have been found in the grounds of prisons with drugs attached. There was also an incident here in Wakefield in November last year where a police horse is believed to have been spooked by a drone, causing him to vault a fence where he collided with a wooden post and sadly died. There are also privacy issues as these drones can film and record areas that previously wouldn’t have been overlooked such as back gardens. As we reported in our previous post, the use of drones is regulated by the Civil Aviation Authority (CAA) whose guidelines state that drones must be flown at least 50m away from people, buildings and airports. They also must not fly higher than 400ft or out of the line of sight of the pilot. This, however, can be very hard to police. With the cost of the cheapest drone starting at just £25 you can see why it’s becoming an attractive, low risk option for criminals. What do you think? Good idea or potentially too dangerous for the birds?